The Ardanaiseig Hotel sits on a remote hillside above Loch Awe, reached after climbing about 10 miles of winding, single track road from Taynuilt in Argyll. Owned by Bennie Gray, founder of the well known Grays Antique Market in London, it is romantic, distinctive (to the point of theatricality) and very welcoming. The Ardanaisaig Hotel has a very good kitchen, a bar stocked with 52 different Scotch whiskys, and a converted Victorian boatshed that may make you want to propose to someone just to stay there. Oh, and did I mention that Wallace the Westie enjoyed the Dog-Friendly ambiance as well? Price Band: $$-$$$. Rates are per person on a B&B basis. Dinner, B&B rates also available. Coming down from the Trossachs, en route to the Ardanaiseig Hotel in the Western Highlands, I saw what looked like golden mist rising from the valley floor. Behind the mist, Ben Cruachan - called the hollow mountain because of the hydroelectric plant hidden inside it - was barely visible. It was 3 o’clock, a still, dry October day and too early for an evening mist to be rising. I rounded the head of Loch Awe and stopped in the small village of the same name. There, from the shore, I discovered the source of the effect - not mist at all, but the late afternoon sun. Perfectly reflected in the mirror smooth loch, it threw buttery bars of gold into the air. An astonishing sight and an omen of good things to come. Loch Awe is Campbell country. 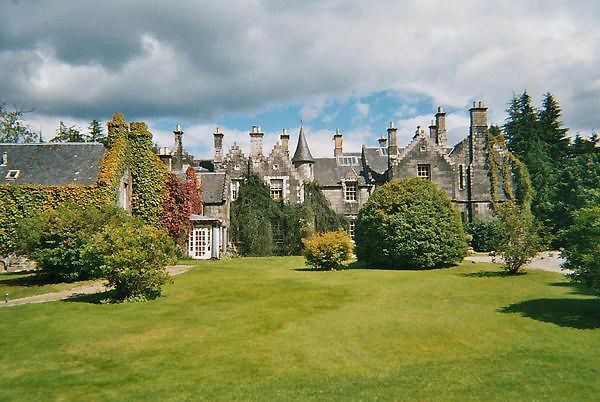 Ardanaiseig was built in the early 19th century, for a member of that clan, in the Scottish Baronial style. Its granite bulk appears after a long and gentle, but steady climb, through the bracken and heather covered hills of Glen Nant. Surrounded by a 100-acre reserve of wild forests, specimen trees and landscaped gardens, its gardens have been listed among the Glorious Gardens of Argyll. There is a secret, walled garden and the lawns fall away to a stone amphitheatre and Loch Awe. Ardanaiseig commands a spectacular position on the loch, occupying a corner where the River Awe slices into the top Loch Awe at an almost 90 degree angle. Small islands and a scenic crannog block the extremely romantic view of Kilchurn Castle, at the northern end of the loch but the hotel's own Victorian steam launch, Gertrude Mathilda, can deliver guests to the remote and lonely castle. To arrive in style Take the train (travel first class of course) from Glasgow to Loch Awe station and ask the hotel to pick you up in the steam launch for a cruise across the loch. Check National Rail Enquiries for train schedules and fares. Interiors at the Ardanaiseig Hotel are classy and glamorous. The original entrance hall is filled with antiques and works of art. The long drawing room, glows with gold. Windows look down over the lawns to Loch Awe and an antique Bechstein piano is finished in warm veneers and marquetry. The mix of furnishing, here and in the guest rooms, is pleasingly eclectic rather than traditional. Its theatrical fun keeps it all from becoming too serious. As I scanned the menu in the green dining room, amid flickering candles and all the accoutrements of an elegant dinner, I noticed some familiar faces in the painting on the wall. Was that Mick Jagger in Victorian dress? Frank Sinatra, Henry Kissinger, Rod Stewart? Apparently the original owner of the painting, acquired by Gray at an auction, was a gangster who, bored with looking at strangers, had the faces overpainted with his favorite celebrities, businessmen and politicians. A stroll down the corrider revealed more such "old masters" featuring Lauren Bacall, Bianca Jagger, The BeeGees in kilts. The kitchen, under the supervision of chef Gary Goldie, prepares wonderful food, cooked with precision. As early as breakfast, I knew I was in good hands. The platter of sliced fruits and berries was so beautifully presented I could hardly bear to disturb it. Coffee was served in comfortable to hold, white china pots, the cooked breakfast included stoved tatties and sparkling crystal dishes held the jams. Dinner began in the library bar, where I studied the menu - and an antique book about the Clan Campbell - while sipping a splendid, elderly Scotch from the selection of 52 whiskys. The 5-course, gourmet menu (£45 in 2007), which included duck with foie gras and a madeira jus, was delicious, the courses perfectly timed. Herbs, vegetables and fruit come from the hotel's own garden. After a finish of coffee and petit fours, I waddled out, totally contented. Lighter meals can be arranged with the chef - a good idea if you are staying a few days, particularly as the hotel is remote and dining elsewhere is possible but not an easy alternative. Ardanaiseig was named the Scotland Romantic Hotel of the Year in 2006 and the Wedding Hotel of the Year in 2007. The hotel is licensed for civil and religious ceremonies. Couples looking for a honeymoon setting or completely private getaway can stay in the loch side boatshed. Next: The Ultra Romantic Boatshed and Getting Married at Ardanaiseig. See what other travelers think and compare prices. As is common in the travel industry, the writer was provided with complimentary accommodation for the purpose of reviewing. While it has not influenced this review, About.com believes in full disclosure of all potential conflicts of interest. For more information, see our ethics policy.